How often do I wish I had a Unit Converter to hand? Here in the UK we are forced to buy our supplies in grams and kilograms even though many of us still use ozs and lbs in our recipes. 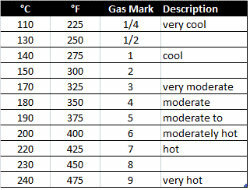 Then there are flozs, ml, pints, quarts....(i'm lost) with ovens that cook in °C, °F and gas marks. To really throw me show me a recipe that talks about cups.....all my cups are different sizes...but apparently that's not how it works. Hopefully the following will simplify things for you (or at least give you a range of cooking weights and measures together in one place). 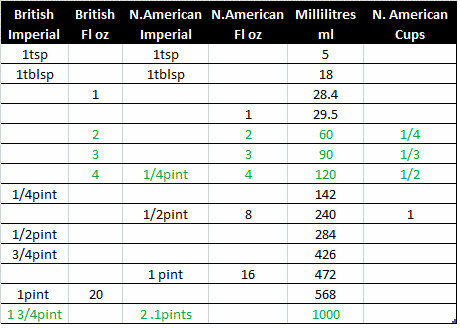 I really should be better at this than I am, I did a degree in Chemical Engineering and the sole aim of our lecturers was to give us calculations to do in a thousand different measures....imperial gallons, metric barrels, inches, kilometers and nanoseconds, Kilocalories and millilitres ...all mixed up together. Or so it seemed! Keep scrolling down for further conversion tables. 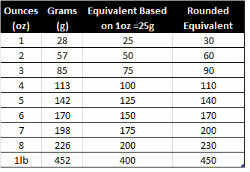 When converting recipes from ounces to grams some people use a metric conversion that rounds to 1oz = 25g. This has the effect of making a slightly smaller quantity of the final product. Care needs to be taken if eggs are involved (use small eggs maybe) and when using this rounding on larger quantities. Figures in green are rounded equivalents. Don't forget to adjust further if you have a fan oven. Follow you manufacturers instructions. Typically with my fan oven I take a further 20 degrees off the temperature and cook for a slightly shorter time. We hope these Unit Converter tables are helpful!